A lot of patients we see are always on the lookout for new ways to feel great, and better health, basically living a better lifestyle – especially after changes in life or a new year. Big motivators can be the holiday period, weddings or maybe something like experiencing something like a back injury, or an injury that puts them out from running, swimming or simply picking the kids up for a while. But when it comes to health, most of us start to overcharge ourselves. We create too much to do for the resources we have, I’ve done it myself gone out and changed everything in the cupboard and fridge, wrote out an exercise plan thinking I can fit it all in, and guess what a few late nights or disturbed sleep from the kids, niggles from Judo and presto it all falls apart, you slump into the settee with the idea of making a smoothie to much hassle and instead settle with a cup of tea and a biscuit or 4 (the kids can smell them out 40 yards away) but in my opinion, this is the hard approach. I know as humans we want results fast (myself included!) even with our health, I simply don’t know how we managed when we had to waits minutes for programs to load with early computers, but that’s often the primary reason why we give up on our new habits after a matter of weeks. When it comes to your health, as with everything else in your life, the key is consistency working with bite size chunks. Chunks that are manageable and achievable. The easy approach is much different – you take a habit, or a behaviour you want to put into action, and make is so small you can’t give it up. 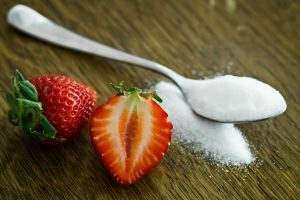 A popular example is eating less processed sugar – a lot of people want to incorporate this habit into their daily life but brush it to the side after a week or two. Why? Simply because it’s tough, and they make the habit too big. They throw out all of the sugar in the house, and banish it completely. But a ‘better’ approach that works for most people is to begin slowly, by cutting certain processed foods out one at a time, so that the habit is so tiny you simply can’t give it up, and as you do so find better alternatives one at a time. From there you increase the habit, and instead of not just eating pastry’s or sweets anymore, you also don’t drink carbonated drinks, then you keep going and you don’t add sugar to your coffee, and before you know it, you’ve cut your sugar intake dramatically! So we know what we need to do we just need to implement them, this means knowing and understanding…. Goals– Set goals to be realistic manageable and achievable. Accountability– The reason weight loss classes work while you attend is they make you accountable, you set your goals and now you need to stay motivated, with a regular assessment in an environment with like-minded people also with a goal, a great way to keep you on track. I have treated many patients who have been to classes, and several family members who have done them. You can see the improvement in health and overall fitness. Reflection– Don’t stop at 10kg weight loss, a drop in dress size or if you have ran a half marathon, reflect on how you feel, move and look with better health and fitness… Now set new goals objectives and stay accountable. PS:Please share and spread the word if you like it.